Paris silhouette skyline mirror. 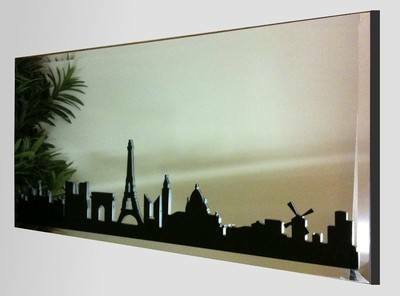 This is a precision cut black gloss silhouette skyline showing some of the world famous buildings of Paris mounted on a wide frameless quality bevelled mirror backing. Truly an unusual and different piece of wall art as well as a mirror. The fixings are already fitted on the back of the mirror ready for hanging.